Not too many crops grow fast in the peak of autumn. Most plants are developing roots then, not their aerial parts. 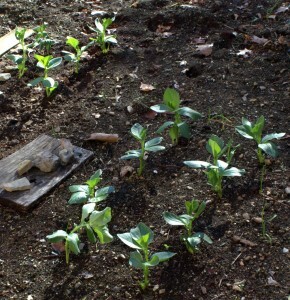 So, there might be an exception in the fava bean. It might be growing a lot of roots too, but the greenery actually grew very fast in the cool fall weather. September is a great time to plant garlic. If you haven’t planted garlic in your own garden yet, we encourage you to give it a try. There’s nothing like digging up delicious bulbs of garlic that grew from your own efforts. Autumn is the best time to plant garlic. 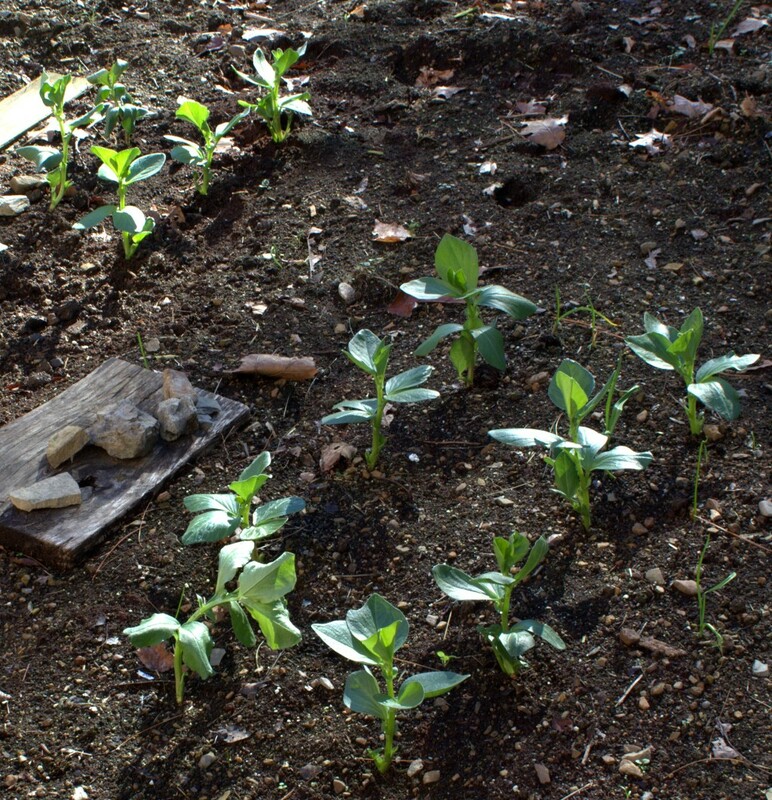 The idea is to get the garlic cloves in the soil before the ground freezes in Winter and to do that early enough to give roots time to develop. 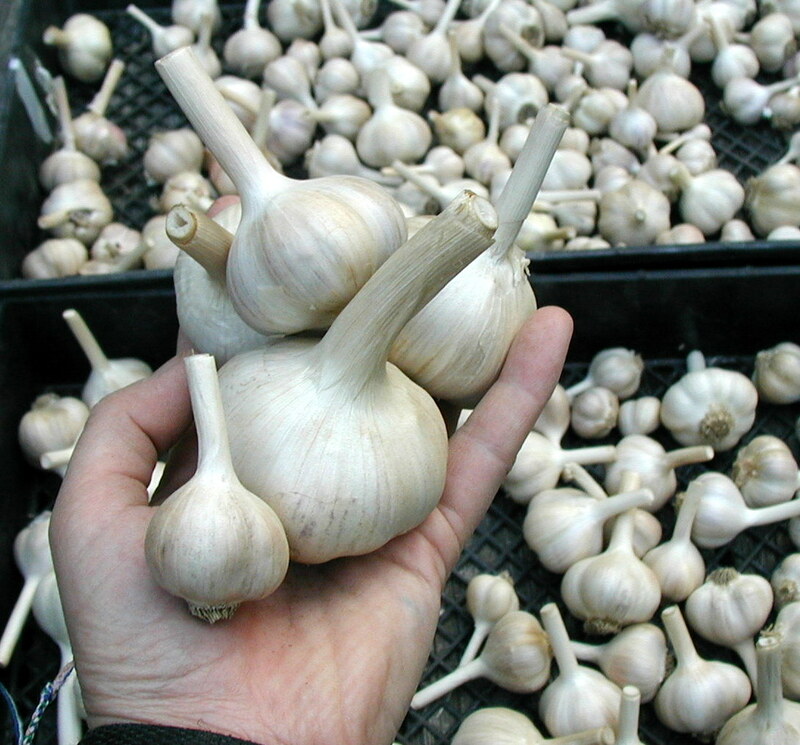 When you do it right, the garlic bulbs planted in Fall should be bigger and better than if you wait until Spring to plant. Check out Amazon for a starter kit of garlic to plant, especially this Gourmet Organic Garlic Bulb Assortment . Having several varieties to try growing will ensure your success! Dig or turn over the soil to a minimum depth of 6-8 inches. You don’t have to get scientific about it, but make sure the soil is loosened up. We want to give the roots some space to grow so digging to 10 inches deep would even be better. Add some organic material like compost or old straw. We like to use straw bales that are a year or two aged by the weather. The old straw breaks down into the nicest, darkest soil. Break apart a bulb of garlic and separate the cloves. Be careful not to remove the outer wrappers or membranes of the individual cloves. Take note of how the cloves fit together in the bulb because you want to plant the cloves in the same orientation. Garlic cloves are pointy on top and flat on the bottom. Push a clove with the flat end down into the soil about 1 inch deep. You want to make sure the pointy end is sticking up and that the tip is no deeper than an inch. Plant the cloves about 8 inches apart. Cover the cloves with soil and tap down. Water liberally. Give the garlic about an inch of water each week unless you’re lucky enough to have Mother Nature do it for you. Watch the weather. What good gardener doesn’t? Be aware of dropping temperatures and protect your garlic once freezing temperatures arrive. After the ground surface freezes cover the garlic bed with 3-4 inches of straw. This will insulate the garlic from temperature extremes in early Spring and help to keep down the weeds when the garlic starts to re-grow. There you have it. By planting garlic in September you’re on your way to a wonderful gardening season next year!